Cat® compact track loaders (CTL) are versatile machines that deliver power and productivity in a small package. Ideal for navigating rough terrain or any job where accessibility is an issue, they are an excellent rental option for a range of applications. MacAllister Rentals has several Cat track loaders available for rent, along with a selection of work tools and attachments so you can tackle any job. Check out detailed specs below or contact one of our representatives to request a quote. Looking for other types of loaders? Browse Skid Steer Loaders, Multi Terrain Loaders or Large Track Loaders. What Is a Compact Track Loader? Cat compact track loaders feature a suspended rubber track undercarriage that delivers improved traction and stability compared to skid steers and similar machines that run on rubber tires. Compact track loaders offer a smooth ride, even on uneven or bumpy surfaces, which allows operators to perform more precise lifting, loading and digging work. Cat machines, in particular, offer several benefits — the company’s best-in-class hydraulic systems deliver exceptional power, while ergonomically designed cabs increase visibility. Proprietary technology such as the “Intelligent Leveling” (ILEV) system improves accuracy and helps operators get complex jobs done in fewer passes. Cat compact track loaders share many similarities with the company’s lineup of multi-terrain loaders (MTL), though each has distinct applications and capabilities. The main difference between the two is that an MTL has a specially engineered undercarriage that delivers lower ground pressure. As a result, they are more suited for use in delicate ground conditions, whereas CTLs offer better performance in rough terrain. MacAllister Rentals rents both compact track loaders and multi-terrain loaders. If you’re unsure which is best for your application, let us recommend the best machine for the job. Why Rent a Compact Track Loader? Rent a compact track loader from MacAllister Rentals to efficiently bulldoze and grade on rough, loose surfaces like dirt or sod. Our well-maintained, low-hour CTL rental units are great for landscaping, construction, agriculture and other demanding jobs. They will deliver minimal ground compaction compared to a skid steer loader, while still offering the go-anywhere capabilities a multi-terrain loader lacks. Optional attachments available from MacAllister Rentals include augers, blades, grapple buckets, landscape forks, stump grinders and more. By choosing the right attachments, you can expand the working capacity of your rental, letting you take on more complex jobs that would otherwise require multiple machines. This, in turn, saves you time, reduces your operating and transportation costs, and ultimately helps you run a more profitable and sustainable business. 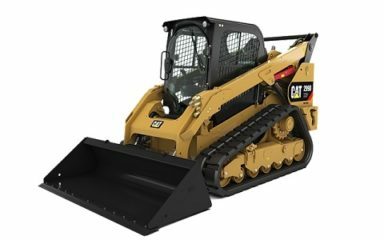 MacAllister Rentals offers compact track loader rentals by the day, week and month, with discounted rates for longer periods and optional financing to make affording your unit easy. As a result, renting can be a smart choice for both long- and short-term applications. We’ll work with you to find an appropriate solution, whether you need additional machinery for a one-off job or you’re looking for an alternative to buying outright. To learn more about your options or to request a quote, contact a MacAllister Rentals location near you.